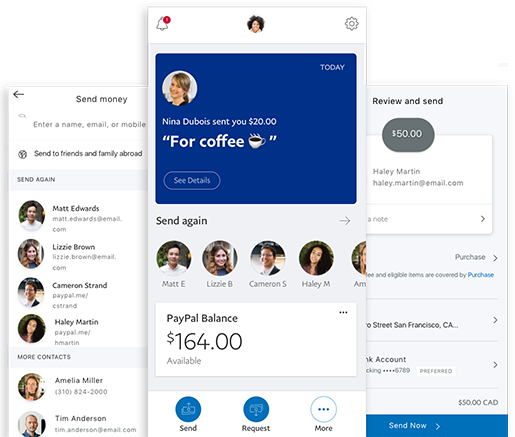 Whether you're sending money, receiving it, splitting the bill, or collecting money as a group, PayPal makes it easy to keep track of all your transactions. Account required to send and receive money. If the receiver doesn’t have a PayPal account, they can easily sign up for an account for free. It’s simple and free to create a PayPal account. Link a bank account, credit or debit card, and you’re ready to transfer money. Quickly send money to people around the world. Simply select your recipient, enter the amount, and hit send. Funds go quickly into their PayPal account. With 24/7 transaction monitoring, encryption and fraud protection, PayPal helps keep your purchases secure. Download the PayPal app to send and receive between PayPal accounts, quickly and easily from almost anywhere. 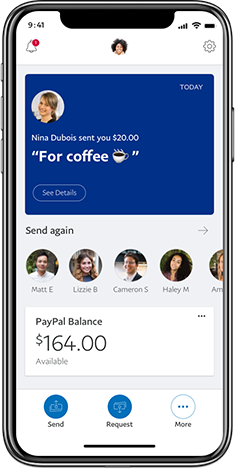 Learn more about the PayPal mobile app. You read that right. If you’re sending money to friends and family within Canada, there are no fees when you use your PayPal balance or bank account. All you need is the recipient’s email address or mobile number, and the money goes right into their PayPal account. If they don’t have one, they can open one quickly. If you send with your credit card or debit card, there's a small fee of 2.9% plus $0.30. Learn more about fees here. With PayPal, it’s easy to send money to almost any country across the globe, and with our new Xoom service, you now have even more sending options. Learn how to send money abroad. Create a Money Pools custom page and collect money for group gifts, travel or special events with ease. Simplify how friends, family and coworkers to chip in for big ticket items today. Learn moreA PayPal account is needed to create a page or to chip in. If a friend doesn’t have a PayPal account yet, signing up is fast and free. Create a unique PayPal.Me link that you can send to your friends, family, or customers to make receiving money even easier. They'll be able to follow the link, enter an amount, and that's it. Sender and recipient must have or open a PayPal account. With PayPal, sending money is as easy as 1, 2, 3. 1 - Enter your recipient's email or phone number (via PayPal.ca or the PayPal app). 2 - Enter an amount and send your money online securely. 3 - Track your transactions in your account activity. How do I send money Internationally? How can I send money as a gift? Can I track my online money transfers? Is PayPal like an e-transfer?